Speaking of unintentional humor, we've reached a subtle moment that a lot of people don't seem to remember. 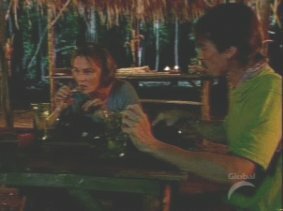 It happens in the eleventh episode of Survivor: The Amazon, when Matthew von Ertfelda's mother gets to come out on a reward and eat dinner with him. You may remember that Matt had a fair bit of difficulty in bonding with the rest of his tribe during Amazon. He never really seemed to connect with anybody and, to be honest, most of the other players were a little bit frightened by him. And why did Matt stand out so much as being different? Well for one the guy didn't talk like anyone else. He had a very formal way of speaking (probably from his time spent living in Hong Kong) and he used odd words in sentences that nobody else in the world would ever use. One of my favorite examples of this is in episode three, when Matt wants to serve his tribe fish for dinner but complains that their campsite "doesn't have proper seasoning or service vessels". Honestly, have you ever heard the word "service vessels" in a sentence? It sounds like something an alien (or a James Bond villain) would say. But Matt always spoke like that and that's why the humans all thought he was a little bit off. They weren't really sure what to make of him, and they really weren't sure what planet he was from. All they knew was that he didn't speak like a normal human being. Mom: "I talk to you at home. Even if I don't see you, I talk to you." Matt: "Oh, I like that. I appreciate it." Mom: (pause) "Don't be too formal." Matt and his mom at dinner. Anybody else would have said "the food was awesome!" But no, in typical Matt fashion he just said, "we admired the buffet." "Don't talk to me like that. 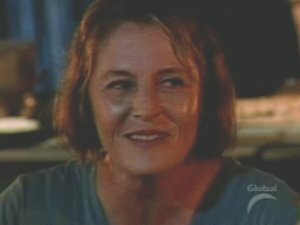 I'm your mother." This scene just killed me because even though the other players were scared to death of him, it showed that Crazy Matt had a mommy who could still scold him if he didn't talk like a normal human being. Not only was it funny, it was actually sort of cute. So way to go, Mrs. Von Ertfelda. Keep your son in line for us, tell him to stop learning Swedish for fun, and keep him away from all those scary-looking machetes. Oh, and tell him to wash his own damn service vessel while you're at it.